A well decorated home goes far beyond the right lampshades and throw pillows. Finding proper home décor is a process that combines functionality and livability with aesthetics. Decorating is harder than it sounds—it can be overwhelming, frustrating, and expensive. Hiring an interior designer can alleviate these complications and bring your dream home to life. Hiring a professional may initially seem out of your price range, but it will save time and dollars in the long run. Interior designers bring the material to you so that you can visualize how the elements will work in your home and skip all the trips to multiple furniture stores. The help of a professional decorator will ensure the quality of items and the visual aesthetic you’re going for so you can stop wasting hours and money on returns, replacements, and changing your mind. A designer will work within your allotted budget to keep everything at a cost that works for you. Even if you think you have a clear vision for an interior space, sometimes you don’t know what you want until you see it. An interior designer can help you achieve the look you’re going for and bring it to the next level. With an array of resources, a trained eye and knowledge of current trends, the expertise of a designer can transform your house into a stylish living space that you’re proud of. An interior designer will maximize your home’s potential. A professional eye will bring a fresh perspective to overlooked spaces to create things you never thought of. Stylized, chic home interiors will increase market value if you’re thinking to sell in the future. Otherwise, the help of an interior decorator will give your home a makeover that you’ll be proud to show off. Hiring an interior designer is the best way to achieve that home makeover you’ve been dreaming about. Contact us at GR Home to begin a collaborative, valuable relationship with a professional interior designer! Whether you can donate it to Goodwill or need to just dump it, one bag of items to get rid of is a productive start on your journey to cleanliness. Pinpoint one area and eliminate all non-essentials. Once this zone is neat, move on to the next one. You’ll establish a flow and freshen up one cluttered corner at a time. Rearrange a room to see how things fit best and what isn’t needed. 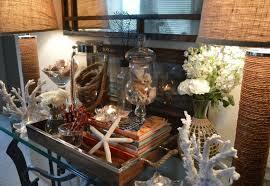 Have another pair of eyes look at your space and get their thoughts—a fresh perspective always amounts to new ideas. Those extra buttons you may never use, that deck of cards from that one place, the box of crayons from your school days… if you can’t bring yourself to get rid of some random items, allocate a space for them. Maybe one day you can bear the thought of parting with your junk. Everything in your home has a place, or at least it should. Assigning spots will decrease the likeliness of loosing things and therefore buying new versions of what you already have. You’ll never have to search for the remote again. Running low on cabinet space? Place your items on the counter. When you can visibly see your stuff rather then shoving it in a cupboard corner, you can distinguish between the necessary and the unnecessary. If you notice something in your home that you don’t use on a weekly, monthly or even yearly basis, it’s probably unnecessary. Eliminating one item a day will prove to yourself how much you really don’t need. Even Oprah Winfrey has to declutter. Check out her 13 Organizing Strategies and Clean Up Your Messy Home! project. Decorating the Patio: Get Ready for Outdoor Dining! It is THAT time of the year again—the time we all dread cleaning off our patio or deck, patio furniture, and making our outdoor dining areas into something that feels magical. Spring cleaning work can be hard—but it’s absolutely rewarding in the end! With the right furniture, fabrics, lighting & decorative pieces, your patio or deck can host the highlights of the summer! One of the biggest decor factors to a patio is the house it abuts. Think about the colors of the house, and the natural flora & fauna around it, that may be good spots to pull texture & color inspiration from. If its time to invest in new patio furniture, consider the size of parties you anticipate having. A four-seater table may be perfect for a family, but it gets a bit cramped when you want to have some friends over for a good cookout. Of course, the size of the patio or deck is an additional limiting factor—but you can change the arrangement based on how many people you’d like to be able to fit! Consider patio furniture an investment. All too often, people find the best sale for a decent set of patio furniture, cushions, or decor without really considering the longevity of those pieces. Deals are great—but a quality product made out of materials that aren’t going to rust, fade, or bleed will last for years. Your outdoor furniture will face a LOT more wear & tear than your indoors stuff—so plan accordingly! Decorate with living things! One of the wonderful things about outdoor decoration is that there’s a much bigger opportunity to plant, garden, and decorate with flowers, bushes, trees & more. Consider the path of the sun—and adjust accordingly. It is wonderful to have space to have a sunset dinner or a late morning brunch on the patio—but the sun can be too hot & too bright for some! Invest in an umbrella that’ll fit the table size that can be tilted to move with the sun. Trees & ivy-covered lattices are an excellent way to provide shade on a hot day, too! If you’re a summer nights kind of person, consider ways to illuminate your patio—both overhead and at the feet. 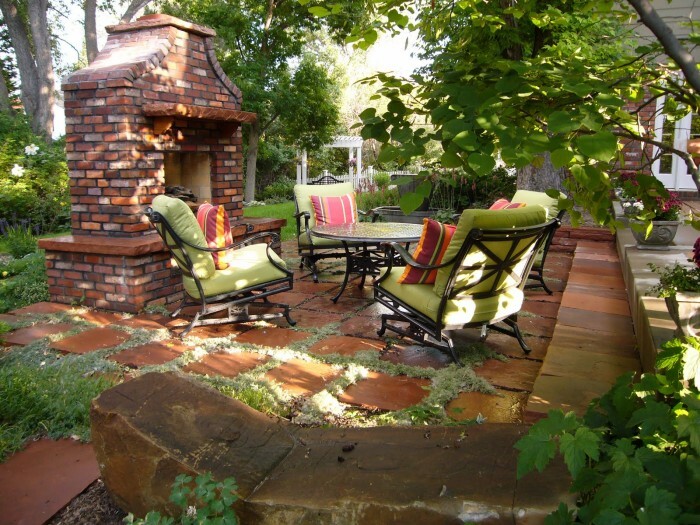 There are lots of really fun & eco-friendly ways to light up your patio! Check out your local home improvement store for solar powered pathway & string lights! There are endless possibilities for the look & feel of your patio! As you get ready to do the spring cleaning, remember last year’s memories & look forward to the ones you’ll make this summer! Seasonal decorating is a superb way to refresh your home decor without totally overhauling your look, taking too much time and/or effort, or breaking the bank. 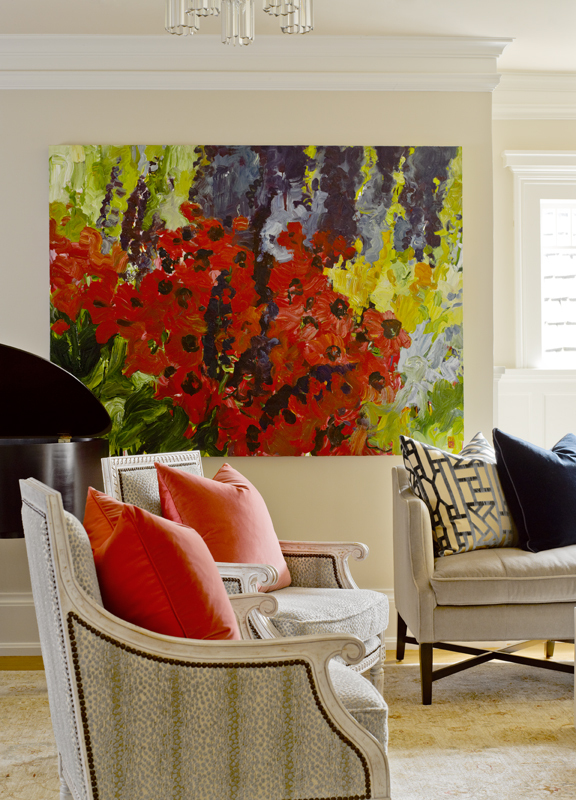 Adding a splash of color (or two) to your home might be just what your living space needs to make the transition from winter into spring and then spring into summer. If you’re getting ready to spruce up your space to match the season, take a look at these four decorating tips for colorful, seasonal spaces! 1. Before you choose your colors, consider the new season’s changes in light that will affect the room. Take into consideration if the light is going to be cool (winter) and add a blueish hue, or warm (summer) and add a yellowish tone. In high-rain seasons up here in the northwest, light tends to be well-diffused and neutral which works well with high-saturation colors. If there’s a lot of bright light in the room, think about avoiding super-bright colors & whites that will be uncomfortable to look at when they reflect the sunlight. 2. As you’re evaluating WHERE you can add a splash of color, think beyond adding a bouquet of flowers to the room. (Of course, we LOVE using flowers to decorate!) Think about swapping out throw pillows, blankets, curtains, and lampshades—or adding color accents to shelves (flowers, carefully selected books, decorative accents, etc.). Without committing to a major overhaul, there are a LOT of areas you can add or swap out colors!! 3. Think about how patterns or plain may influence the appearance of your space. If your current decor is mostly patterned, consider accenting with bold single-colored pieces. If your decor is mostly flat colors, think about how some patterned curtains or throw pillows may add to the feel of the room! Especially in the spring, a tasteful floral pattern or a bold geometric pattern might be just the thing! 4. Research trends & this season’s colors. For example, Pantone’s color of the year is Radiant Orchid (18-3224)—which is a light orchid purple color that compliments nearly any neutral theme well. Take into consideration whether you want to go with the trends, or fight against them! At the end of the day, choosing colors to decorate with is all up to you. It’s your space—do you love how it looks? 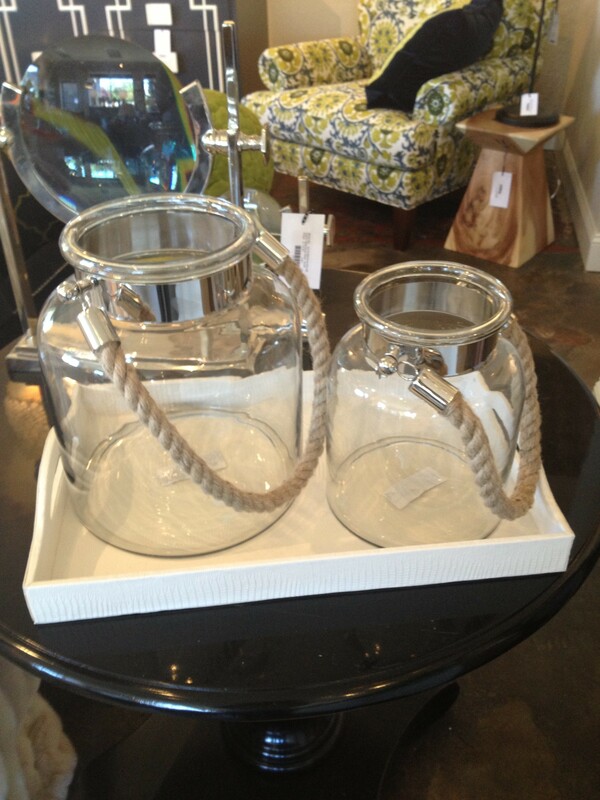 Have you refreshed your decor lately? What colors did you use? 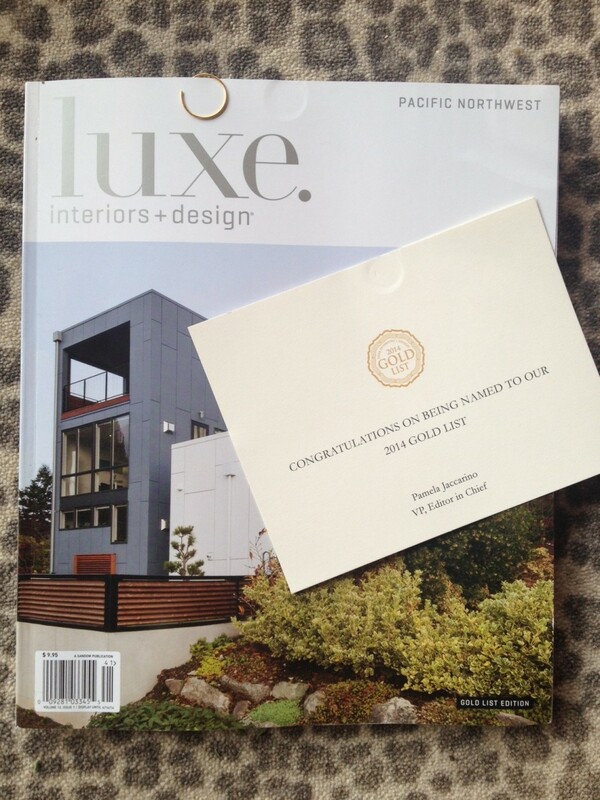 At GR Home, we’re ecstatic to announce that we’re on Luxe Magazine’s 2014 Gold List! Luxe Mag’s Gold List is a coast-to-coast compilation of over 600 of the best design professionals—including home builders, kitchen & bath designers, interior designers & architects, landscape architects & more. It is wonderful to earn such high accolades from one of the most popular home & space design magazines in the nation. In addition to our wonderful news from Luxe Magazine, we’re excited to see Restyle Source, an online community that we’re a part of, partner with Lee Furniture, one of our top vendors, to encourage local shopping & locally sourced product. Restyle Source’s “Local Love” section lists Washington companies so you can support your local economy while making your environment beautiful & functional. Restyle Source & Lee Furniture are making it possible for you to see something you love & connect with a local business to make your vision for your space come to life. We love that these big, national companies are supporting local companies like GR Home. It’s thrilling to to be receiving this amazing honor from Luxe Magazine, but it is, in some ways, more exciting to see companies like Luxe, Restyle Source & Lee Furniture hone in on smaller companies that are the lifeblood of local economies. This national-level support for local business will help ensure that local businesses will be able to continue to be an integral part of their home economies. We’d like to say a big thank you to Luxe Magazine for choosing this Seattle-grown business for their Gold List; and to Restyle Source & Lee Furniture for focusing on local shopping & sourcing. And—a HUGE thank you to the family, friends & local businesses that have supported us along the way! We look forward to being a part of the national design community & local economy for years to come! Beige and gray can be nice, but everything needs some nice pops of color to brighten things up and set the mood in a room. You don’t have to be very adventurous to find unique ways to bring more color in to cheer things up! Color is expressive. It has personality and even has power to change your mood if it is one tone versus another. Color can enliven a space or cause it to be more relaxed or serious. Color really is number one when it comes to home décor and design. Photo from an Interior Design project we completed in a Medina home. Windows: Whoever said you had to stick with neutrals or toned-down patterns for your drapes, curtains and blinds? Put up some billowing, bright, apple-red window panels in the dining room to dress up the space. 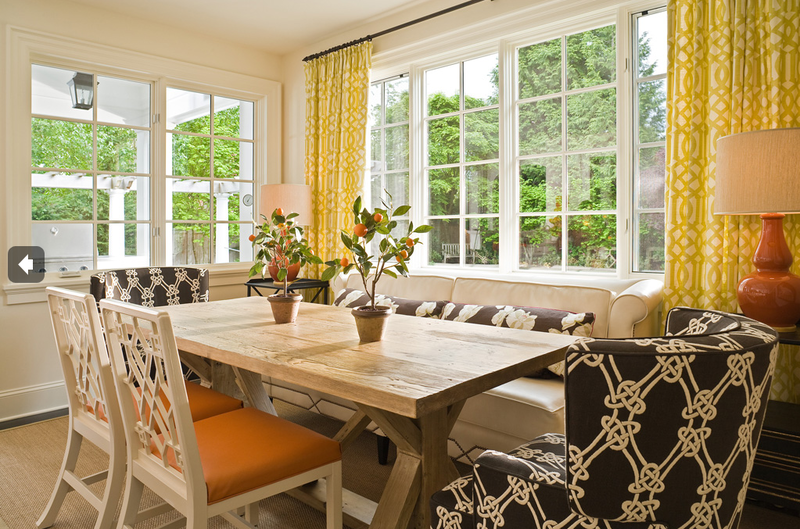 Or install citron yellow folding shades for a cheerful window-top pop. Furniture: Sure, neutrals might be ‘safer’ and more versatile for design changes, but they are nowhere near as much fun as a vivid lime upholstered dining chair! If committing yourself to bright color for long-term pieces is hard, why not go for the removable kind of seat cushion instead? Side tables, headboards, ottomans and other secondary furniture pieces are also lovely places to incorporate vibrant shades. Accents: Pillows are one of the easiest ways to add color to a space without breaking the bank, but there are more accents and décor pieces out there to use for color pops! Think trays, vases, knick-knacks – even lampshades! 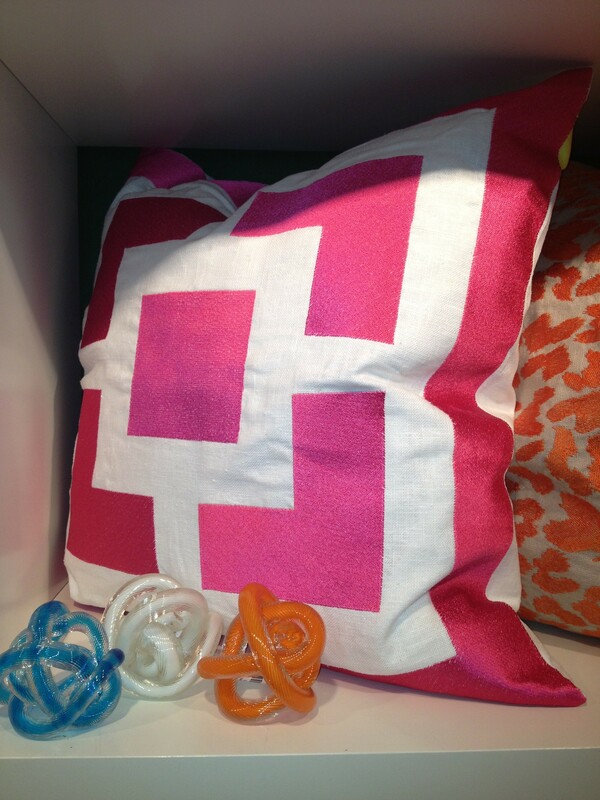 Colorful accessories on a neutral palette allow for a lot of flexibility in your space. Tabletop: Apple green glasses for everyone! Think a little bit differently when it comes to your tabletop settings and centerpieces. Get colorful with your serving ware, incorporate some vivid items in the centerpiece, or go bold with the table linens. The table is supposed to be a gathering place – encourage a cheerful mood! Storage: You don’t have to stay with the eggshell white closet doors and plain fixtures – wallpaper the inside of your closet with something vivacious and exciting! Better yet, cover the whole door in a vivid hue or upholster it and add some texture with nail head trimmings. We wish you the best as you bring some color to your spaces! Be sure to stop by our store near the University Village in Seattle for some fabulously colorful pieces, and we’d be happy to offer some tips and suggestions. Back in March, Graciela had a fun chat with Cristin Priest over at the Simplified Bee blog. That conversation really brought out what Graciela and our whole team are trying to do within the world of home décor and interior design, so we wanted to take it a step further on our own blog. Let’s start with the walls, and specifically, paint color. Graciela told Cristin about her favorite paint colors – Revere Pewter, Hale Navy, and Raccoon Fur from Benjamin Moore, and Seed Pearl from Pratt and Lambert. We love the grays and dark colors (Graciela is partial to black) because it gives a strong foundation to whatever palette you’re using in your room. Neutral walls offer a versatile backdrop to all sorts of colors and styles. 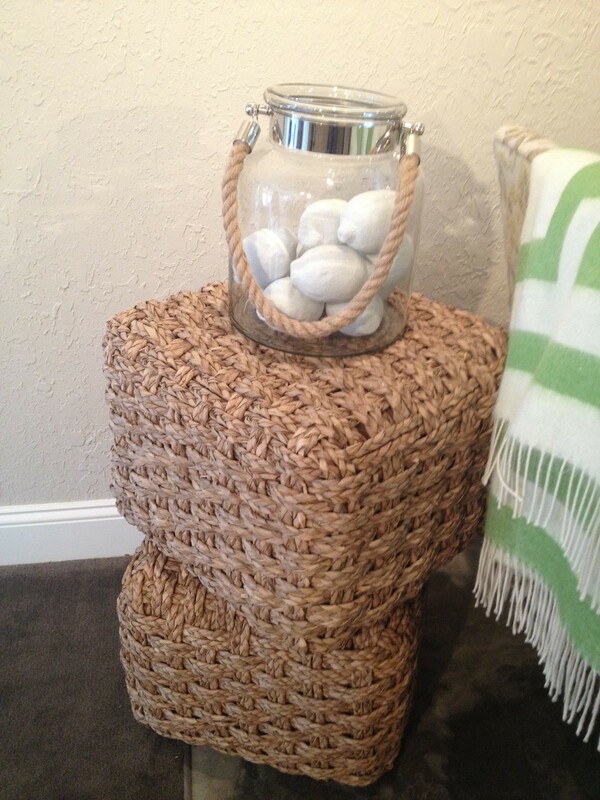 Graciela’s style, and the style of GR Home, is “casually elegant. Classics with a bit of modern thrown in,” as she told Cristin. How does that play out in practice? 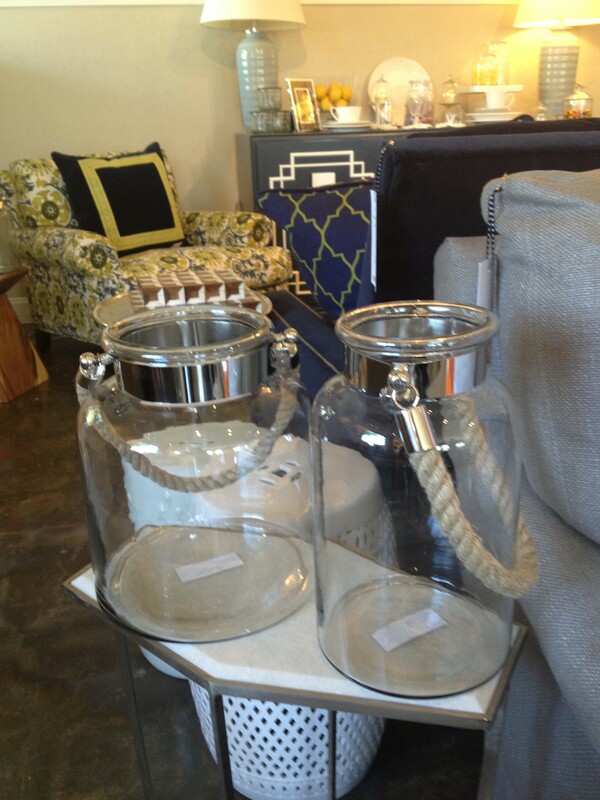 We keep the classic furniture shapes, with modern additions like Lucite, bright and shiny colors, and leopard print. In fact, no room is complete without a bit of leopard print, according to Graciela. Relating to more than just style, we recommend that people splurge on the sofa in your family room, pillow fabrics, bed linens, and lampshades. The emphasis is placed on the areas and things you spend the most time with – your family room sofa is probably the most-used piece in your home, and you spend a huge portion of your life sleeping. Plus, the pillows and lampshades are the little extra details that really add punch and personality to your space – and you deserve some little luxuries here and there. In the Q&A with Cristin, Graciela advised that people save on expensive custom tiles and the bedroom furniture. “I know, we all want to think we will use that beautiful Chaise, but it’s probably going to just hold clothing,” she said as an example – totally something lots of us do. 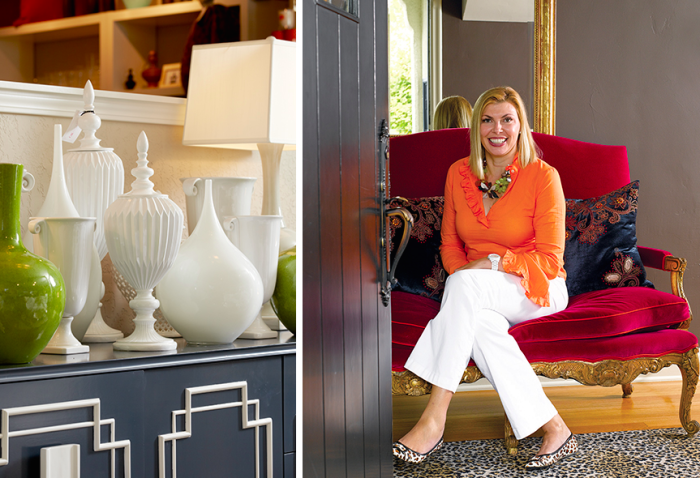 Graciela Rutkowski Interiors style comes down to elegant, but approachable design. Color is a must, and playful additions like leopard print and fur are fun textures and patterns that we really love to bring into a space to display personality and casual elegance. What’s iconic to your style? Is there something that no space in your home is complete without? 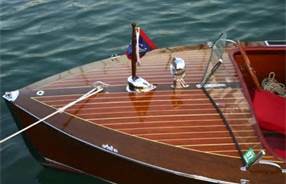 With the Windermere Cup and Opening of Boating Season happening last weekend in Seattle, we have seen a lot of nautical inspiration. There is nothing quite like being on a boat in Seattle and cruising around the lakes and Puget Sound. It is truly one of the most beautiful places on earth and we feel extremely blessed to live and work in this amazing city. Even though we don’t personally have a boat, we have many things in GR Home that are “boaty”. 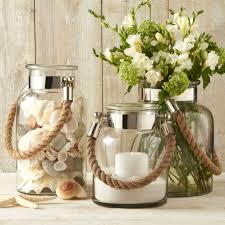 Come in and check out our nautical décor. 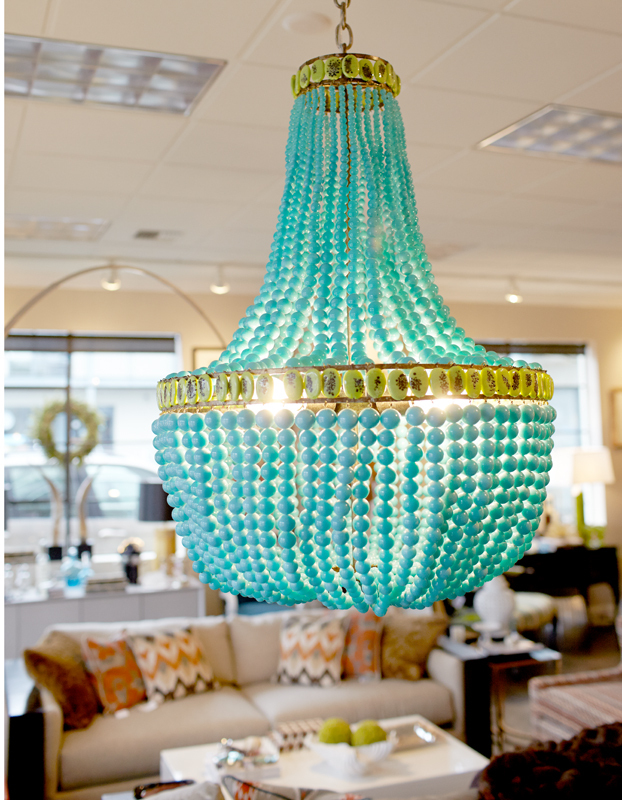 I absolutely adore this chandelier. It is the Hedy by Currey and Co. and although it’s been around a while, it is one of my favorites. What do you think? It brings a smile to my face every morning when I walk into work. Happy Wednesday!